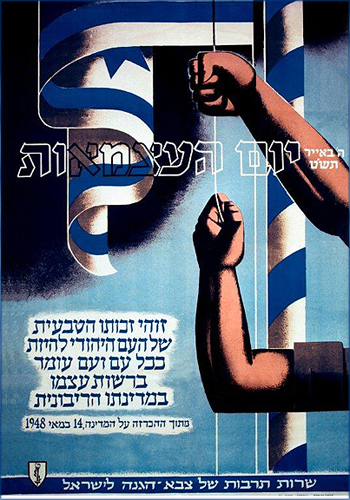 Every year since the very first anniversary of Israeli independence (with the exception of 1957), the Ministry of Education has produced a poster celebrating Yom HaAtzmaout. Anyone flying in or out of Israel will probably have noticed the exhibition of those posters at Ben Gurion airport. I always make a point of looking for ‘my’ poster – the one produced in the year in which I came to Israel – and noting how many have followed. But my favourite of all the many beautiful designs is the very first one from 1949 which carries a quotation from the Declaration of Independence that is just as relevant today as it was all those decades ago. In contrast with most other nations, that natural right still has to be defended and protected by Israelis. As we make the difficult transition from a day of commemoration for those who gave their lives defending their country to a day of celebration of 64 years of Jewish self-determination, here is a film tribute to the current generation of Israel’s soldiers who stand guard every day of the year to defend our country, our independence and our natural right to both. With thanks to Shoot East for their permission to use the film. Happy Independence Day and may there be many more to come. I hope the Day is peaceful and brings joy to all who live in, and support, Israel. It’s a bit Stalinist, don’t you think? Yes Adam, the imagery is “of its time”, but, as Hadar points out, the sentiment is still very much up-to-the-minute. Happy Yom Ha’atzmaut to all Israelis and Jews everywhere. Happy to agree, for once, with a Gooner!